Today we took a new path through the woods and got a bit lost. The familiar markers were gone and their comfort and clarity gone with them. That’s often the way with forging a trail—you get easily disoriented. But it is a bit more so for us right now. 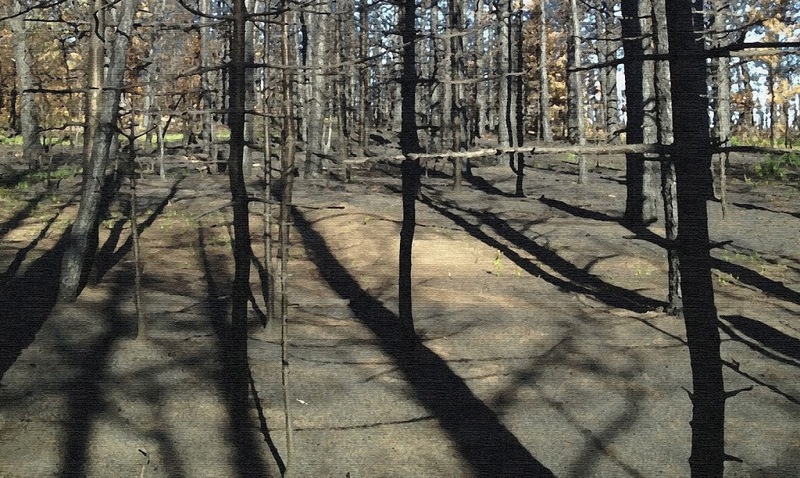 The woods we walk through by our little Colorado cabin have been engulfed in a forest fire and are now just charred fields with black skeletal trees poking up from an ash floor. So we don’t actually need a path any more because all the old obstacles are gone, the gorgeous pine trees and aspen groves are burned. We can walk pretty much where we want, although what we want is for this fire to never have happened. I didn’t want this change, I didn’t want this blasted new path. I want things the way they were. My path through cancer was similar. The old ways of doing things—enjoying my martinis and wine, eating fatty foods, taking exercise only sort of seriously, working too hard and taking on too much stress—had to be replaced by a healthier, cancer-fighting life. I am so much the better for it, but forging that new post-diagnosis trail was the pits. And I resent having to do it. I did visualization exercises as part of my cancer treatment, and the tree-lined path to our cabin is what usually came to my mind when I tried to envision beauty and hope, a place in the future where I could see myself after the chemo and radiation and endless doctor visits and tests were over. Visualization can be potent, getting you out of your current ordeal and helping you see that there can be life and fulfillment after all this. Still, I have often wondered why I saw this simple, non-spectacular cabin path. Why not the dramatic mountain just beyond it? Or the verdant meadow with its little stream? Or even the cabin itself, with its cozy, friendly interior? Why the path? I think it was because the calm that engulfs me at the cabin starts on that path, making the path itself a symbol of better things to come, of hope. I always feel so positive on that path—I know it ends in comfort. This year, though, a portion of that path is burned, some of the trees just black sticks, the ground a mixture of ash and charcoal. The cabin itself is fine—thanks to God and the firefighters. But much of our nearby forest is gone, and the paths that once snaked through the woods are just vague marks in the ashy ground. Still, more often than not, we look for those old trails and follow them as much as we can. I think it’s because the paths are our link to life before the fire, our tie to normalcy. If we stay on the path that gets us up the hill and over to the next meadow, maybe we can forget the destruction around us, the sad state of our forest. A little part of things will be like they were before. Same way with cancer—the old familiar faith in our health, security about our future, and clarity about our present is gone, replaced with a vague route through an unfamiliar and frightening landscape. I retired from a job I loved because too much of it had turned to stress and worry and because I knew I would be too busy to exercise and eat well. People remind me that the forest will grow back and will likely be even better than before. They are right, of course, but it’s hard to see right now. And, more than seven years after my cancer diagnosis, I know that my overall health is better than it would have been had I not had that health scare. I feel obliged to treat my body better. And the new life I have forged, with a mixture of the old and new, is pretty amazing—I feel challenged by the writing and part-time teaching I do, but I can now relax and plan my days the way I want them. And the world is full of people like me who have survived to live a strong and happy life that, in many ways, is better than before. Yet I have lost so many friends to this disease, and I feel their presence and their absence as I walk on. I think of the spouses, children, and siblings who have been left behind. My heart especially breaks for parents who have lost their daughters and little children who have lost their mommies. Their lives have been altered beyond comprehension, and I hope we can all lend a hand to them, helping them find their way onto a new path of love, one that honors the beauty of our memories and the hope of the future.